Whether your students live in an urban, rural, or a shore environment, they will learn how their everyday actions affect the ocean. 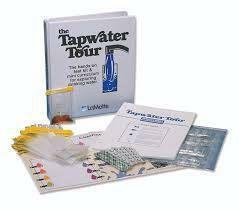 Inquiry based activities, lesson plans, water testing procedures, games, and actual news articles combine into a comprehensive thought-provoking curriculum. Focusing on coastal ecosystems, oil spills, shoreline development, marine debris, and careers in marine science helps students develop a sense of stewardship towards shore environments and bodies of water. Includes five units of study with lecture materials, supplies for 40 students, teacher instructions, TesTabs® reagants, test strips, and a CD with printable handouts and data sheets. WARNING: This product is not a toy or game, but does contain either small parts or pieces that could become choking hazards to children less than 12 years of age.